Based on the Old Testament and the play "Nabuchodonosor" by Francis Cornue and Anicète Bourgeois. * Final cast still to be determined, this list is based on our last production. The action takes place in Jerusalem and Babylon in the years 602 y 562 before Christ. The Babylonians led by their king Nabucco are about to enter Jerusalem, the Jews hold Fenena, daughter of Nabucco, as a hostage to negotiate. Theater La Scala in Milán on the 9th of March 1842. The priests and the people of Jerusalem cry in a passionate chorus the defeat that puts their fate in the hands of Nobuchodonosor, king of Babylon (called here, as in the opera, Nabucco). They beg God to spare the temple. In an impressive solo, Zachariahasks them to trust in God. The news of Nabucco ‘s advance worries them again. Ishmaele the messenger is left alone with Fenena who the Hebrews were able to kidnap. He loves her since the day she rescued him, after he was sent as an emissary of the Jewish people to Babylon and sent o prison. Their talk is interrupted by the arrival of Abigaille's sister Fenena, heading a troop of Babylonians soldiers. She threatens the lovers with inminent death, but after confessing her love for Ishmaele, she offers to save him if he would respond to her love. Zechariah interrupts them, announcing the arrival of Nabucco to the temple. The Babilonian soldiers arrive and Nabucco appears at the door. Zachariah threatens to sacrifice the king's daughter, Fenena, if he dares profanning this sacred place. Nabucco mocks the conquered Hebrews, Zechariah raises his dagger over Fenena... and Ishmaele snatches his weapon. Nabucco, mad with rage, ordered his soldiers to sack the temple. The Hebrews are taken captive to Babylon. Nabucco leaves for the war after entrusting his daughter Fenena to the regency. Abigaille is jealous of her sister. Anxious to know whether she Nabucco‘s she eventually discovers that she is a slave. Her fury calms down evoking her love for Ishmaele. Her great aria is full of sweetness and expressiveness. She then learns through Baal’s High Priest that Fenena has decided free the Hebrew. He incites her to seize power and announces the rumor of the death of Nabucco. Abigaille’s reaction is again a « cabaletta » full of vigor and determination. The Hebrews are assembled in a room in the palace. In a wonderful example of verdian oratory, Zachariah implores the help of God. The people curses Ishmaele, but Zachariah reminds them that it was thanks to him that Fenena was converted to their faith. Abdallo announces the king’s death and that Abigaille is plotting against Fenena. Abigaille enters and reclaimes the Fenena’s crown, but at that very moment Nabucco arrives, seizes the crown and places it on his head, defying Abigaill. The King predicts that this incident will have terrible consequences and beings an impressive piece where the contrast between soloists and choir is highlited. He proclaims himself as God, and forces Zachariah and Fenena to prostrate at his feet. A supernatural force pulls the crown of his head. He goes crazy and mumbles incoherently, he feels persecuted and weeps that his own daughter does not come to his help. Zechariah proclaims that heaven has punished him, but Abigaille seizes the crown and shouts that the glory of Babylon has not yet come to an end. Abigaille is still regent, supported by priests that claim the death of Hebrew prisoners, among whom is Fenena. The faithful Abdallo introduces to Nabucco before Abigaille. A long duet then begins between the mad king and his assumed daughter. He is indignated to see her on his throne, but after Abigaille’s taunts, he finally agrees to sign the death of the Hebrews; finally he begs her in a fit of despair. On the shores of Euphrates, where the Hebrews sing psalms longing their lost home. 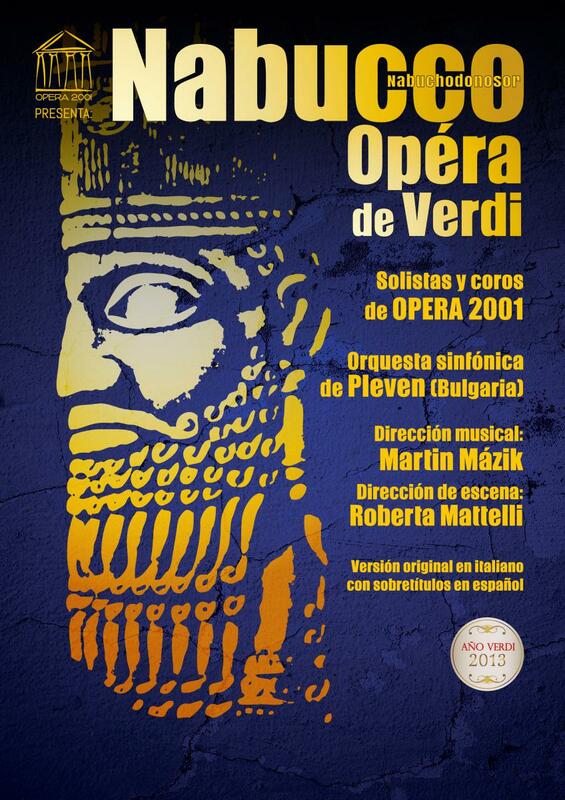 "Va, pensiero" is the first of the great patriotic chorus of Verdi, a moving melody. Zachariah criticises their defeatism and tries to give them courage predicting the imminent fall of Babylon. In prison, Nabucco awakens after a nightmare (which was suggested in the prelude). He hears the cries of the crowd demanding the death of Fenena. He sees her walking towards the place where she is to be executed and starts to pray to Jehovah to save her, asking to be forgiven for his great sin of pride. Abdallo appears then with the guard and frees Nabucco why rushes to rescue his daughter. At the place of execution a funeral march preceeds the beautiful prayer of Fenena who is preparing to die with the Hebrews. Nabucco and his entourage stop the sacrifice. The false idol drops to the ground as if by magic. All united offer a prayer to Jehovah as appreciation. Abigaille appears, overcome with remorse, she drinks a poison and is dies in front of everyone, asking forgiveness to God. Zachariah predicts the glory of Nabucco, who has just converted.